When preparing to create this week's Camera-Critters post, it suddenly dawned on me that I never showed you photos of "the big butterfly with blue on it" that I was photographing (per my secretary's orders) when I saw the Hummingbird Moth. Well, what kind of blogger would I be to promise you photos and then not deliver? I guess I just got all wrapped up with the other critters which showed up at work, such as the Walking Stick. Don't let it be said that I promise photos and don't follow through. 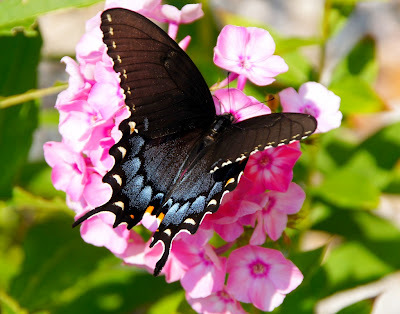 I present to you "the big butterfly with blue on it", also known as a female Tiger Swallowtail of the Black Variety. My secretary especially like this photo. for my photographing such beauty. and swashing, as it is. Definitely a beauty, absolutely gorgeous. Three cheers for your secretary, and three more for you. 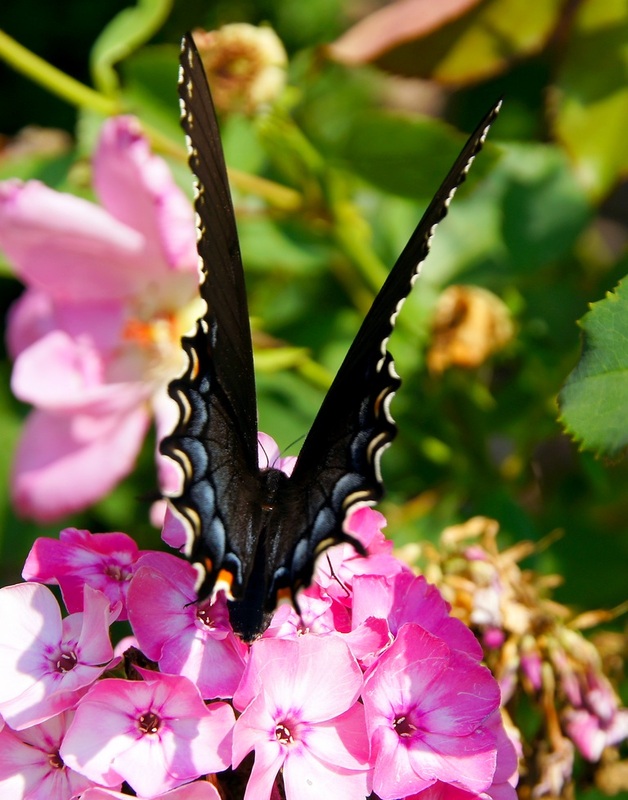 Lovely shots of the swallowtail, Misty! The flowers are beautiful too. Great captures, have a wonderful weekend. I hope you feel better soon. She really stands out against the pink flowers. The clarity and color of your photos is excellent. Butteryflies have been making their down south and I have seen several beautiful varieties just this week. Get well soon. Fabulously clear butterfly shot! Love that last one . I love the swallowtail butterflies! Beautiful captures. Beautiful butterfly and your photos, too. The Butterfly certainly deserves it's own post. What great shots.